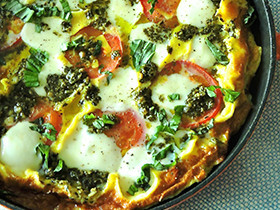 If you love the flavors of Margherita Pizza or Caprese Salad (tomatoes, basil and fresh mozzarella cheese), then give this simple, summery frittata a try! Serve it with a colorful green salad for lunch, brunch or dinner. You will need a 10-inch, oven-proof, non-stick skillet with a lid for this recipe. In a medium bowl, whisk together eggs, milk, salt and pepper until well blended and a bit frothy. Heat olive oil in non-stick skillet over medium heat. Add egg mixture. Reduce heat to medium-low, cover and cook for 5 to 7 minutes, until edges look like they’re beginning to set. Using a rubber spatula, raise the edges of the frittata so that any uncooked egg runs underneath. Cover and cook 2 to 3 more minutes, until top is still a bit wet but almost cooked through. Meanwhile, preheat oven broiler but leave rack in center position. Layer slices of mozzarella and tomatoes over eggs in skillet. Dot with small dollops of pesto. Transfer skillet to oven and broil frittata for 1 to 2 minutes, until cheese is melted and eggs are completely cooked and slightly browned around edges. Be careful not to burn it! To lower the fat content or if you’re just not a fan of pesto, simply omit it from the recipe. Then add 1/3 cup freshly grated Parmesan cheese to the beaten egg mixture before cooking, and sprinkle lots of chopped, fresh basil over the finished frittata before serving.